What do we really mean when we say “the object is red because it reflects red and absorbs all other colors”? Even high school students who can recite this fact have a hard time grasping the implications of that fact. The confusion lies in their lack of a concrete experience with the phenomena – it may be common knowledge that “white” light is made of of many colors and wavelengths, but until they are separated out and studied, the STEM concepts remain abstract and difficult to grasp. 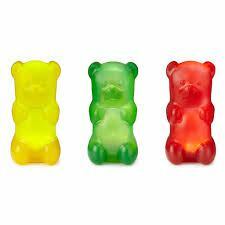 Gummy Bears and lasers come together in this fascinating question, “What happens when you shine green light on a red gummy bear, or red light on a green gummy bear”? In addition to making color theory a bit more clear, this is a great exploration of the otherwise abstract concepts that describe the most basic of light-matter interactions: Absorption, transmittance and reflection of light.